Twelve clubs, five matches each, with titles to be won, European places to be clinched, and relegation to try to escape. This weekend, the post-split Scottish Premiership battle begins, with each club having five matches against those around them to make or break their seasons. BBC Scotland has looked at the data from the opening 33 rounds of fixtures to pick out a few key issues that may well arise in the coming weeks. Craig Levein is hopeful influential forward Steven Naismith will be fit for Hearts' Scottish Cup final against Celtic on May 25, but he may need the on-loan Norwich City 32-year old back far sooner than that if the Edinburgh club have any hope of improving on their current position of sixth. While Hearts have a decent enough record against other top-six sides, their performances tend to take a nosedive when Naismith does not feature, which could pose huge problems for their next five league fixtures. With Naismith in the side, Hearts have averaged 2.05 points per game. Yet, when he's either been injured or suspended, that figure has fallen drastically to just 0.79 points. 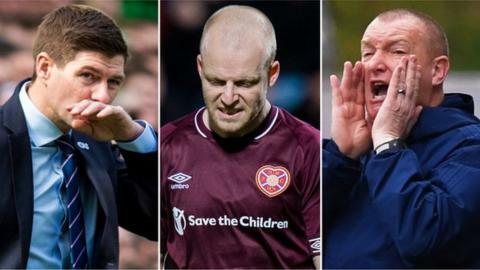 This could explain why Levein's team have picked up just six points from their last five Premiership fixtures. Hamilton Academical fans will not rest easy until the season is done with their side sitting comfortably in 10th, but the stats suggest the coming weeks may play out favourably for their club. Perceived as the perennial Premiership survivors, Accies have undoubtedly got more experience than most when it comes to getting over the line. And, in Brian Rice, they may have found a manager that can squeeze out enough points to stay in the division. Not only has Hamilton's points per game figure jumped from 0.72 under Martin Canning to 1.1 under Rice, but during his 10-game tenure he has also overseen a win over St Johnstone and draws against St Mirren and Dundee. At this stage of the season, there is no silver bullet that can assure Hamilton of survival, but their recent managerial shift suggests they are improving and should have enough to put sufficient space between them and the bottom two spots. Steve Clarke will be among the contenders for manager of the year, but Kilmarnock now have to face the other five top-six sides, which could take a little sheen off the club's end-of-season parade. Although Kilmarnock's season highlights will include wins over Celtic, Rangers and Aberdeen, their overall record suggests there is a notable drop off in points gained against the better teams in the division. Of the 58 the Ayrshire side have already amassed this season, just 19 have come against top-six sides - Clarke's side have actually picked up the majority of their points - at least 66% - against the bottom six. Chance for Rangers to flex muscles? With second place all but confirmed, and their Scottish Cup ambitions long since over, Rangers seemingly have very little left to play for between now and the end of the season. However, Steven Gerrard will be determined that his side not only prolong Celtic's seemingly inevitable coronation, but also improve upon their terrible record against other top-half clubs this season. Rangers have an impressive 78% win ratio against teams placed between seventh and 12th this term, but that figure drops to just 33% against teams in the top half. The Ibrox side will likely finish the split in the same position as they start it, but they can certainly alter the perception that they tend to drop off when they meet the better teams in the division.